Your pancreas is an organ that is located just below the stomach and stretches partway across the back of your abdomen. Its main functions are to secrete enzymes into your intestines that aid digestion and to produce hormones involved in the regulation of blood glucose. A key pancreatic hormone, insulin, delivers glucose, our most important source of energy, to cells throughout the body. The process begins in the mouth, where enzymes in your saliva start to break down the carbohydrates in the food you’ve consumed. As food travels through the digestive tract, additional enzymes in the pancreas and small intestine further break down the partially digested carbohydrates into simple sugar molecules, most notably glucose, that are permitted to pass through the intestinal wall, enabling them to enter the bloodstream. After glucose enters the bloodstream, it triggers beta cells in the pancreas to release insulin. In turn, insulin acts like a “key,” opening a door that is specifically designed to allow glucose to enter many cells in the body, including energy-utilizing cells such as muscle, red blood, and fat cells. This “opening” allows glucose to move from the bloodstream and into those cells, where it is used for energy (or stored in the liver and muscle tissue for later use). This absorption of glucose by the cells prevents glucose levels in the bloodstream from rising too high, which can damage nerves, blood vessels, and other tissues over time. In type 1 diabetes, the pancreas produces little or no insulin, and instead of entering the cells, glucose remains in the bloodstream unable to be used for energy. In type 2 diabetes, the pancreas produces and releases insulin, but the cells are not sensitive enough to it and insufficient glucose enters the cells. 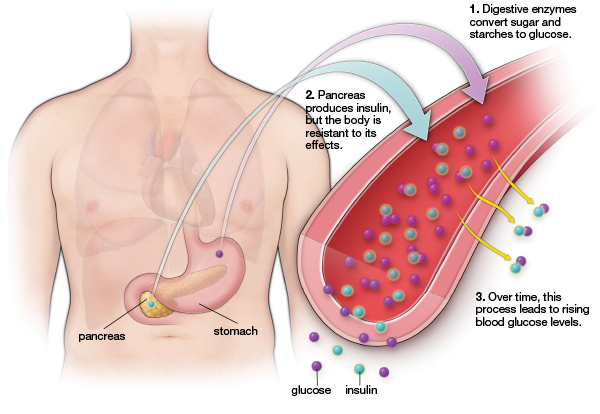 Glucose that remains in the bloodstream signals the pancreas to produce even more insulin. Eventually, the pancreas is unable to produce enough insulin to overcome the cells’ resistance to it and treatment is needed.